Here is the second official teaser for the all new LaCrosse. Good news since the current car has been around for a while. The new version of the 3.6 Liter V6 will be available. But I'm sure the 2.0 Liter Turbo will be the base engine. Since it is in the more expensive CTS. Here are two pictures of the real thing. At least for the Chinese market. Looking pretty much like the same car in the teaser. Unless GM has 2 different designs of the same model. Like they do with the 2016 Cruze. I like the dash. 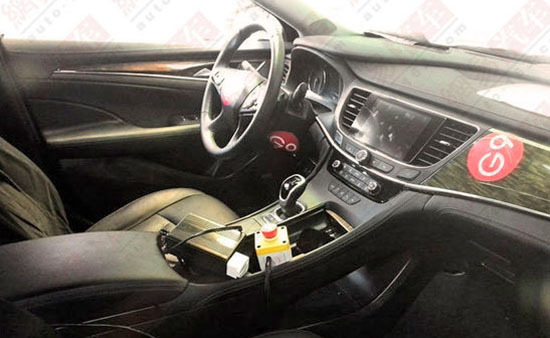 It looks like the dash of a 2016 Hyundai Genesis. Lots of wood=very upscale. That's the Hyundai Equus inside and out. I'm sure the next gen LaCrosse will be a nice looking vehicle. The problem: Will people be able to block the great looking Avenir Concept from their minds in order to truly appreciate this new gen LaCrosse? I'm sure Buick will reference the Avenir as an influence on the design in the marketing for this new LaCrosse, so they will essentially be creating their own perception issues. I am 61... I am far too young to drive a Buick. (an underrated sedan) or the Encore (a CUV that right-sized for the city). @ 61 year old - hilarious.